The Nuss procedure is a minimally-invasive procedure, invented by Dr. Donald Nuss for treating pectus excavatum. He developed it at Children's Hospital of The King's Daughters, in Norfolk, Virginia. The operation typically takes approximately two hours. Through two small incisions in the side of the chest, an introducer is pushed along posterior to the sternum and ribs, and anterior to the heart and lungs. Then a concave stainless steel bar is slipped under the sternum, through the incisions in the side of the chest. A third, smaller incision is made to insert a thoracoscope (small camera) used to help guide the bar. Taller patients, older patients, or patients requiring extensive correction may receive two or more bars. All bars may be placed through two incisions or additional incisions may be made. The bar is then flipped, and the sternum pops out. To support the bar and keep it in place a metal plate called a stabilizer may be inserted with the bar on one side of the torso. PDS sutures may also be used in addition to the stabilizer. The stabilizer fits around the bar and into the ribcage. The bar and stabilizer are secured with sutures that dissolve in about six months. Eventually, the bar is secured with muscle tissue that regrows during the recovery time. Although initially recommended only for younger patients, the Nuss procedure is now commonly used on patients in their thirties and forties with excellent results. Postoperative evaluation indicates a significant improvement in pulmonary function studies and a high proportion of patients report improvements in well being and an increase in exercise tolerance. Although this procedure is categorized as "minimally invasive", one must not infer that recovery from this procedure is minimal. Post-operative pain control can be quite challenging thus requiring multi-modal pain management, such as epidural. Nurses who attend these patients post operation generally concur that this operation is one of the more difficult recoveries of any operations for children. Recovery time is generally four to five days as an in-patient, depending on the patient age, activity level, co-morbities and post-operative complications (if any), followed by time at home to overcome the pain and to let the bar settle into place. Patients younger than fifteen often require only two to four weeks at home after being discharged from the hospital for recovery. However, older children and adults typically require a greater recovery time due to the increased ossification (and thus decreased flexibility) of their bones. For six weeks, physical activity should be limited (i.e. no running or strenuous physical activity, and lifting is limited to ten pounds or less). Walking for exercise and breathing exercises aid in recovery. It is sometimes suggested that weight-training should be limited or eliminated for up to three months. It is also recommended that any sports where contact may occur should be avoided. However, aerobic sports are encouraged, as results after bar removal are best maintained in patients who have stimulated their cardiopulmonary systems while the bar is in place. After a period of six to ten months, the athletic skills are almost completely recovered. 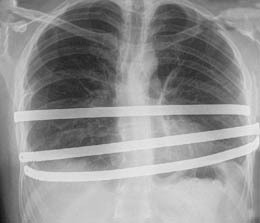 After a period of two to four years, the surgical stainless steel bar is removed from the patient's chest. This outpatient procedure lasts approximately ninety minutes. The patient stays at the hospital for a few hours. With the use of stabilizers and PDS sutures, bar displacement rarely occurs. If these methods of bar fixation are not used, bar displacement may occur. This can be quite painful and requires some sort of intervention: either bar removal, or repositioning of the bar with some sort of bar fixation. Patients should understand prior to the surgery that if bar displacement occurs soon after surgery, a second surgery will be immediately required which is even a more difficult recovery as the patient is already weakened and in pain. High impact trauma, such as car accidents can dislodge the bars, causing extreme pain. This is the reason for the restriction on driving, because a sudden defensive maneuver, such as a jerk of the steering wheel, could dislodge the bar up to six weeks directly after the surgery. Other complications which may occur include hemothorax, pleural effusion, pericarditis, wound infection and pneumonia and acquired scoliosis. Vigorous incentive spirometry is used to prevent pneumonia. Some patients are allergic to one of the components of stainless steel. As a result, allergy testing is now routinely done prior to surgery. In the event of an allergy, a titanium bar will be used. Again, it is very important to be fully aware that although the surgery may be minimally invasive, the recovery process and risks of complications (and consequences thereof) are not minimal. Nuss Procedure. 9 May 2011, 22:59 UTC. In Wikipedia: The Free Encyclopedia. Wikimedia Foundation Inc. Encyclopedia on-line. Available from http://en.wikipedia.org/wiki/Nuss_procedure. Internet. Retrieved 6 July, 2011. The older you are, the more time you need!